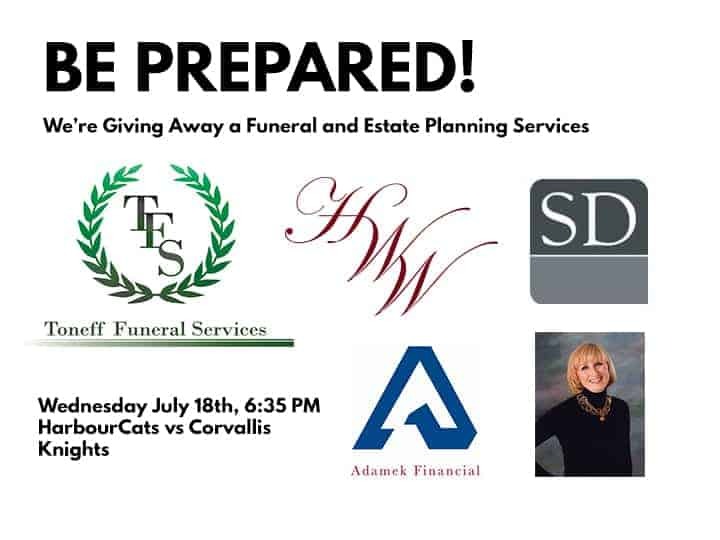 On Wednesday, July 18 – fans at the Victoria HarbourCats game vs. the Corvallis Knights, a rematch of the 2017 WCL final series, will have a chance to win a funeral. TONEFF FUNERAL SERVICES and H.W. WALLACE CREMATION SERVICE are providers of cremation and funeral service to the people of Vancouver Island, and are pleased to offer the draw winner a basic cremation package, which includes but not limited to the following – cremation service, cremation casket, and one original death certificate. This has a retail value of $2,500. As well, do you have a will? As part of this, MARY S. McMANUS, a barrister/solicitor with the Stevenson Doell Law Corporation of Victoria, will provide a Will, Power of Attorney and Advanced Directive for Health Care — worth $800 (excluding taxes and disbursements), helping the winner ensure their family is looked after for those days we all will eventually encounter. Adding to the package, Adamek Financial will schedule a complimentary insurance and financial planning consultation, to assist with the dollars-and-cents aspects of planning for the future. Scott Grant, Senior Consultant for Adamek Financial – a company with corporate season tickets to HarbourCats games – will spend time with the draw winner. “This is a way to bring awareness to making sure people plan their futures in a way that helps their family deal with something that is inevitable to us all,” said Jim Swanson, Managing Partner of the HarbourCats.